Getting Crafty with Jamie: Going going gone!! STAMPIN’ UP! RETIRING PRODUCT SALE STARTS NOW! LAST CHANCE TO GET THESE RETIRING PRODUCTS! SAVE UP TO 50% on a huge inventory of select Stampin’ Up! 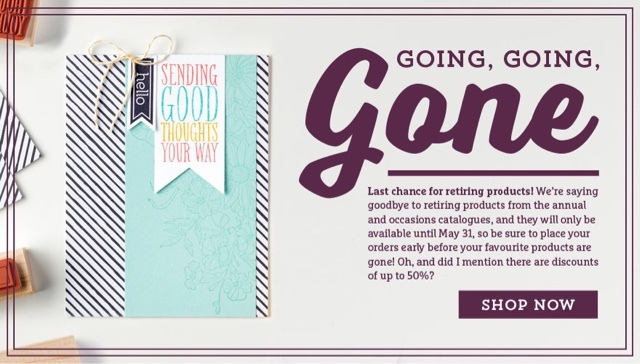 retiring products including stamps, punches, dies, ribbon, designer series paper and much more. The sale starts TODAY (April 18). These products are only available while supplies last and can sell out quickly. See ALL retiring Stampin’ Up! products in my store here OR click on the buttons below. when you place your on-line order through me for ALL product orders up to $150. If your order is $75 or more (before shipping and tax), I’ll send you a collection of 4 stunning cards from my recent OnStage Stampin' Up! event - that I made for the leaders of Stampin' Up! Please do not include the host code on orders of $150 or more (before shipping and tax). 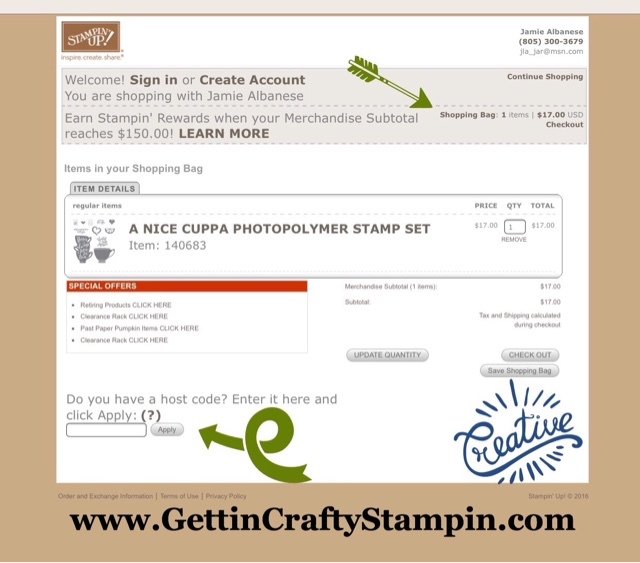 Product orders of $150 or more will earn stampin’ rewards as well as qualify for the hand-crafted cards (4 pretty cards!) from me automatically. The hand-stamped cards will arrive in early-May, separately from your order. My host code offer ends April 30. At the BOTTOM of the Order is where it asks for a Hostess Code and is where you add the HOST CODE 3RKQZWUV! Don’t forget to check the Stampin’ Up! Clearance Rack, and 15% Off Bundles for extra savings. I love hearing from you. If you have a question or thoughts to share about today’s post, please, EMAIL ME HERE.